Get 1 x Revive muscle warming spray and 1 x Mint Muscle warming balm with this bundle. The Revive Spray avoids direct contact with the skin and is perfect for those who want to share their Sidekick tools but do not want to spread germs and bacteria. Our Revive Muscle Warming Spray is formulated using 100% All Natural ingredients. Not only does it provide a warming effect to soothe tense muscles, but it also acts as a lubricant to eliminate the friction between the skin and the Echo Muscle Reliever. This is especially useful for dry skin, or those with lots of hair. The balm is made in Canada with organic ingredients so you don’t have to worry about skin breakouts. Our Mint Muscle Warming Balm is formulated using 100% All Natural ingredients. Not only does it provide a warming effect to soothe tense muscles, but it also acts as a lubricant to eliminate the friction between the skin and your Muscle Reliever. This is especially useful for dry skin, or those with lots of hair. The balm is made in Canada with organic ingredients so you don’t have to worry about skin breakouts. 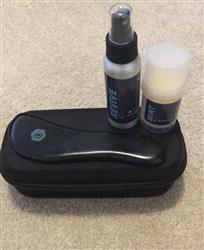 I love Sidekick tools the stick balm and spray. I’ve used this product for my calf stain and plantar fasciitis. I use it pre and post workout on my calf’s to prevent injuries. I’m a runner training for Ragnar and I can’t afford another injury. I also use it on my ITB, glutes, quads/hamstrings. Upper traps for tension relief from migraines/headaches. I recommend this product to everyone.